Like reality TV? 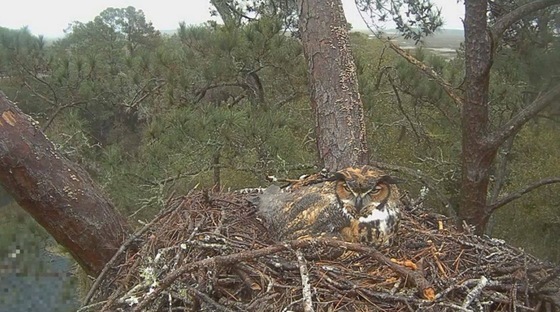 It doesn’t get any realer, or wilder, than live video from these Georgia wildlife cams. - Pip watch is on at the bald eagle nest live-streamed by Berry College. As of Friday, the two eggs laid in early January were expected to hatch any day. Stay tuned via Berry’s cams, which are also shared via Georgia DNR’s Wildlife Resources Division. - About 300 miles to the south, great horned owls at The Landings near Savannah are watching over two eggs in a nest once used by bald eagles. The great horned adults raised two owlets on camera last year, as followed by The Landings, the Cornell Lab of Ornithology and DNR. - The Wildlife Resources Division also offers the Go Fish Education Center cam – peering into a 15-foot deep aquarium that mimics life in a Piedmont reservoir – and a peregrine falcons cam that will start streaming as soon as the falcons begin nesting, more than 50 stories above Atlanta. Here's how you can help conserve Georgia’s wildlife and wild places. - Buy or renew a DNR eagle or hummingbird license plate. Only $25 more than a standard Georgia plate, these tags support DNR’s Nongame Conservation Section, which depends largely on fundraisers and grants to conserve animals not legally fished for or hunted, rare plants and natural habitats. - Give directly to the cause, join the nongame friends group TERN or explore other ways to help. Learn more at www.georgiawildlife.com/conservation/support. Pardon the pun but prescribed fire season is off to a hot start in Georgia. - A prescribed fire by Interagency Burn Team partners U.S. Forest Service, Georgia Forestry Commission and Georgia DNR that covered more than 1,300 acres on Oconee National Forest. - The first prescribed fire in more than a decade on the state’s newest conservation lands, Altama, a nearly 4,000-acre addition to Altamaha WMA. - A single day in which five seasonal fire crews burned sites across the state, from a high-priority private tract prepped for planting longleaf beside middle Georgia’s Fall Line Sandhills Wildlife Management Area to DNR Game Management and Nongame Conservation Section staff and The Orianne Society burning targeted areas at Sansavilla WMA near Brunswick. - The reintroduction of fire to 450 rugged acres at the Boy Scouts’ Lawhorn Scouting Base along the Flint River in west-central Georgia. 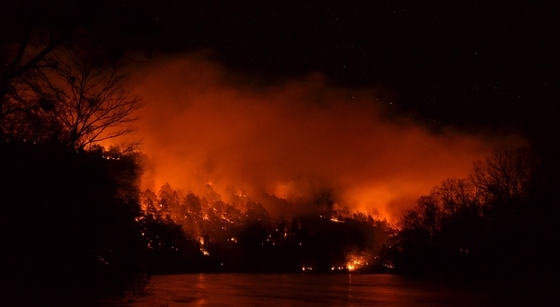 The burn included more than 100 acres of old-growth montane longleaf pine forest. Often called controlled burning, prescribed fire is a safe way to apply a natural process, ensure ecosystem health and reduce wildfire risk. Many rare wildlife species in Georgia, such as gopher tortoises, need habitats shaped by the fires that regularly swept Southeastern forests centuries ago. DNR’s Wildlife Resources Division, including Nongame Conservation and Game Management, burned more than 52,000 acres managed by the division in fiscal year 2015. The Interagency Burn Team, a blend of trained “eco-burners” from agencies, nonprofits and the public, spreads that effort even further. Most burning occurs during winter and early spring, though more is being done throughout spring. Forestry and wildlife conservation leaders joined with Gov. Nathan Deal at the State Capitol this week to recognize Feb. 7-13, 2016, as Prescribed Fire Awareness Week. Cold weather sends Georgia bats searching for safe places to hibernate, including warmer climes, caves and sometimes even bridges. Snug only an inch or so below 60-mph traffic, bats can roost in expansion joints less than 1/2-inch wide in bridge decks. The concrete collects solar energy by day and slowly releases the warmth at night, providing a haven where the flying mammals can spend long winter periods of torpor. But bridge work can put those bats -- animals protected by law -- in danger. The U.S. Fish and Wildlife Service, DNR and the state Department of Transportation are working to safely exclude and remove bats from bridges due upgrades or replacement. The most recent example is the Ga. 128 bridge over the Flint River near Roberta. DOT is replacing the bridge. DNR and Fish and Wildlife Service staff checked it one morning last month after learning bats might be roosting there. Forty-five minutes later, they had removed eight big brown bats. Trina Morris, a DNR Nongame Conservation Section wildlife biologist, said rescuers had no idea what they would find. The rescue involved a mechanical lift and old-fashioned innovation. Using a heat gun, Fish and Wildlife Service biologist Pete Pattavina modified a pancake spatula to create a tool for gently removing hibernating bats from narrow cracks where fingers couldn’t reach. The bat-ula – Morris’ suggested name – was born. Each was wrapped in a separate canvas bag and put in a refrigerator until the weather warmed. 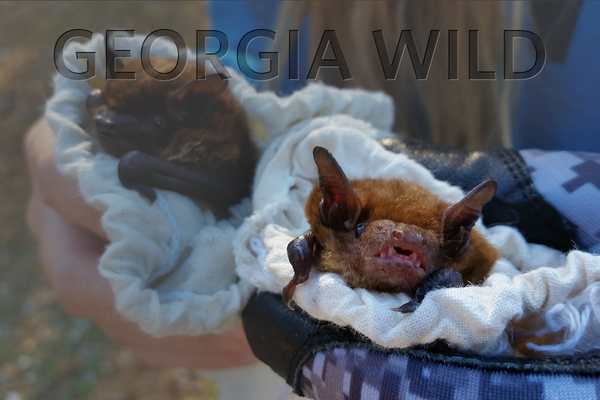 After temperatures rose the following week, biologists released the bats at nearby Big Lazer Wildlife Management Area. The hope is they’ve since found a safer place to roost. If you’re reading this, chances are one of your favorite winter pastimes is feeding birds. You spend hundreds of dollars on feeders and foods to attract birds within easy viewing distance of your home. But so far, most of this winter has been a disappointment for those of us who enjoy seeing white-throated sparrows, cardinals, dark-eyed juncos and a host of other species dining at our backyard bird cafes. 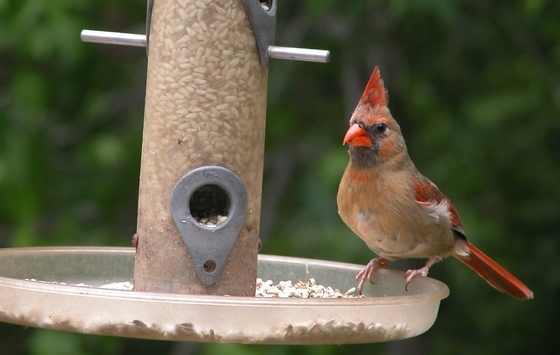 Record highs and heavy rains have helped slow the rush of hungry birds at our feeders to a trickle. Read the rest of Terry’s column to learn what problems to watch for, and how to help prevent them. Annual reports aren’t supposed to be this engaging. 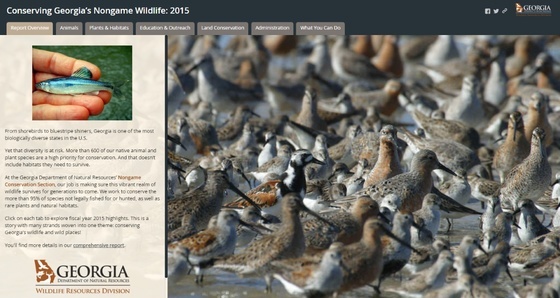 Explore a year’s worth of wildlife accomplishments, challenges and other updates in the DNR Nongame Conservation Section’s 2015 story map. Halfway through the North Atlantic right whale calving season, 13 mother/calf pairs have been seen off Georgia and Florida. An annual average of 20 calves has been documented since 2000, but the total has been about 15 calves a year the past five years. According to Clay George, DNR’s lead biologist working with the endangered whales, six other whales have been seen, most of which are females, raising hopes there are still more calves to come. Photos. Rattlesnakes will be one of many creature features at the 49th annual Claxton Rattlesnake & Wildlife Festival, set for March 12-13 near the south Georgia city. The Evans County Wildlife Club festival, which stopped buying or selling wild-caught rattlers in 2012, draws some 15,000 visitors with attractions such as DNR’s shooting simulator, Georgia Southern University birds of prey programs and multiple live snake exhibits, plus food vendors, a parade and even a beauty pageant. The aircraft-led migration of young whooping cranes from Wisconsin to Florida ended Feb. 6 – and with it, the Operation Migration flights guiding whoopers on their first migration south. The Whooping Crane Eastern Partnership says efforts to restore the eastern migratory population of the endangered birds will emphasize “more natural methods of rearing and releasing” cranes, and the 2015-2016 ultralight-led migration was the last. A pilot’s perspective. Weekend for Wildlife, the nongame wildlife fundraiser held recently at Sea Island, raised more than $1 million, a record for the 28-year-old event. Top auction items benefiting nongame friends group TERN included commission paintings by Peggy Everett and a women’s island outing that went, all told, for $49,000. Warmer water welcomed nearly 300 cold-stunned sea turtles stranded in North Carolina and carried by DNR from the Georgia/South Carolina line to Washington Oaks Gardens State Park in Florida. As shown here and in this recently posted video, volunteers helped release the young reptiles, mostly green sea turtles, over two days. Under the gold dome, Georgia lawmakers are considering legislation such as the Georgia Legacy effort to fund acquisition and management of priority lands and House Bill 736, which calls for a wildlife license plate to support coastal habitat restoration. The Georgia Conservancy tracks conservation-related bills; the General Assembly also posts copies, votes and updates. During Sportsman’s Day at the Capitol, Coastal Conservation Association Georgia announced HB 736 and an $18,500 check for DNR to enhance artificial reef SAV, one project the Coastal Conservation Association affiliate is pursuing this year. 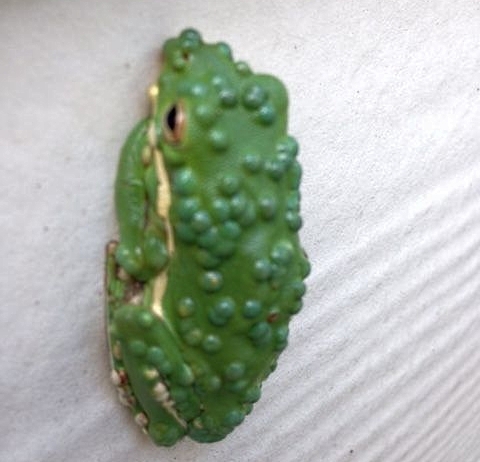 A green treefrog found in December near Port Wentworth was covered in blister-like nodules caused by trematodes. While the parasite is common, the burden – or number of larval trematodes – afflicting this frog (above) is considered rare, according to researchers. To help protect salamanders in America from a deadly fungus known as Bsal or salamander chytrid, the U.S. Fish and Wildlife Service has banned importing or transporting 201 salamander species. Bsal has caused major die-offs of sallies in Europe, and at least 18 of the 57 species native to Georgia are considered susceptible and possible carriers of the disease. Fourteen of the 404 species petitioned for Endangered Species Act listing in 2010 by the Center for Biological Diversity and others have been withdrawn. Three are Georgia species: Altamaha arcmussel, Altamaha shiner and inflated floater. The Fish and Wildlife Service issued a 90-day finding for 374 of the others in 2011. West Indian manatees, the manatee species that frequents Georgia’s coast, would be federally downlisted from endangered to threatened under a Fish and Wildlife Service proposal. Growing manatee populations and a pending petition led to the finding, a recommendation the service first suggested in 2007. 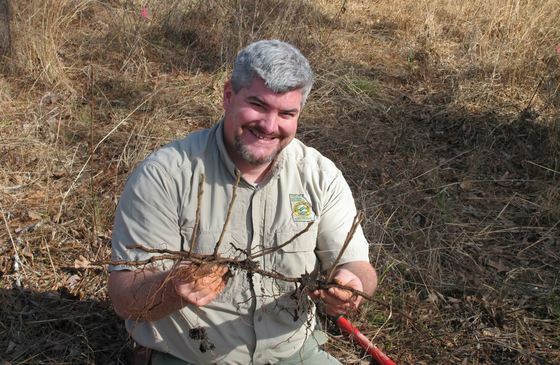 Rhizomes of dwarf sumac – males and females – were recently transplanted from Lower Broad River Wildlife Management Area to Beech Hollow Farms in Lexington. The Georgia Plant Conservation Alliance project, coordinated by Nongame Conservation Section botanist Dr. Mincy Moffett and including biologist Thomas Floyd and Beech Hollow’s Pandra Williams and Jeff Killingsworth, will provide for an ex situ collection and for in situ outplantings of the endangered shrub, which naturally occurs in Georgia at only two sites. Mayhaw and Chickasawhatchee wildlife management areas in southwest Georgia have another 5,100 longleaf pine seedlings, recent plantings led by biologist Phil Spivey of the Nongame Conservation Section. Spivey also used a mulching machine to remove hardwoods in young longleaf stands at Silver Lake WMA. Whale strandings reported last month on the Georgia coast included possibly the state’s first recorded stranding of a True’s beaked whale, a juvenile found on Wassaw Island Jan. 19. What was possibly a Cuvier’s beaked whale stranded on Wolf Island – killed apparently from intestinal obstruction after ingesting plastic sheeting – and a pygmy sperm whale on Cumberland Island. The “land of trembling earth” is the next stop for Becoming an Outdoors-Woman. 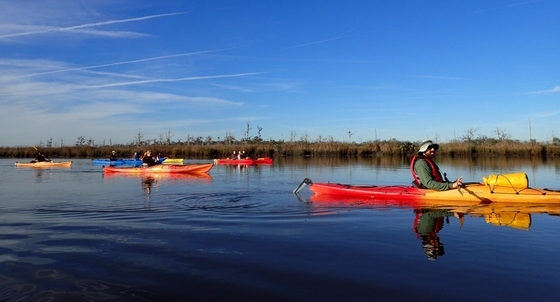 The DNR-hosted workshop series that offers women a practical introduction to outdoor skills and activities is set for Feb. 19-21 at Okefenokee National Wildlife Refuge. Gov. Nathan Deal and DNR leaders honored Plum Creek, Georgia Power and CatchMark Timber Trust (above) Feb. 3 as 2015 partners in the Forestry for Wildlife Partnership. The companies had a combined positive impact for wildlife on about 1 million acres, according to the voluntary program that promotes forest and wildlife conservation among corporations with large forest holdings. Federal funding to the tune of $4.8 million is available for Georgians to improve the health and productivity of their working farms through the Conservation Stewardship Program. Administered by the U.S. Agriculture Department’s Natural Resources Conservation Service, the program – USDA’s largest for conservation – will add an estimated 10 million acres nationwide during fiscal year 2016. The Paint Rock River watershed in northeast Alabama will benefit from an 860-acre conservation easement by The Nature Conservancy in Alabama. The chapter's largest private easement represents a group effort involving landowner John Gully, Open Space Institute, the Tennessee Valley Authority and the Fish and Wildlife Service. Names in the news: The National Wild Turkey Federation’s Georgia chapter has named DNR Game Management Section wildlife biologist Bobby Bond its Wildlife Manager of the Year. The group cited Bond's work documenting wild turkey reproduction declines in Georgia as a density-dependent population response, a trend since recognized in other states and spurring study of what’s called the Southeast Wild Turkey Reproduction Decline. The General Assembly recently recognized the Law Enforcement Division’s Cpl. Casey Jones, who works in northwest Georgia, as DNR Ranger of the Year (video). Nongame senior wildlife biologist John Jensen teamed with Dirk Stevenson (Orianne Society), Elizabeth Schlimm (Joseph W. Jones Ecological Research Center at Ichauway) and Matt Moore to publish a review of records on the distribution, habitat and status in Georgia of the imperiled spotted turtle. Feb. 12-15 – Great Backyard Bird Count. Feb. 16-18 – Longleaf Academy: Longleaf 101 (The Longleaf Alliance), UGA Tifton Campus Conference Center, Tifton. Also in Georgia: May 16-18, Ft. Stewart. Feb. 21-27 – National Invasive Species Awareness Week. Webinars, other events. 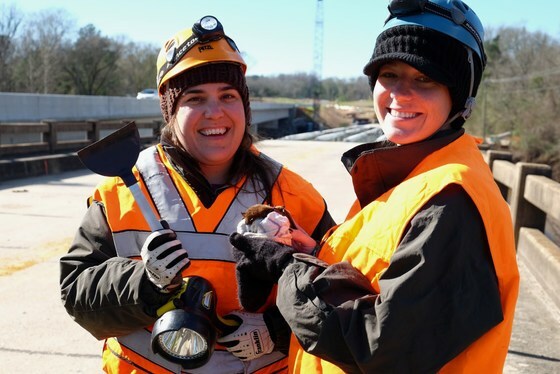 Feb. 27 – 6:10 a.m., bird banding at Panola Mountain State Park, Stockbridge. Also: 6 a.m. March 5, 6:30 a.m. March 26, 6 a.m. April 16. Georgia Important Bird Areas program coordinator Charlie Muise. April 22-23 – Georgia Youth Birding Competition. Finish, banquet at Charlie Elliott Wildlife Center, Mansfield. - Nongame newsmakers of 2015. - A bird for all seasons. "Georgians, wildlife will soon roam what tycoons called home," Atlanta Journal-Constitution. Also: "Acquisition of Altama a worthy undertaking," The Brunswick News, plus Effingham Herald, WFXG-TV (Fox 54, Augusta). 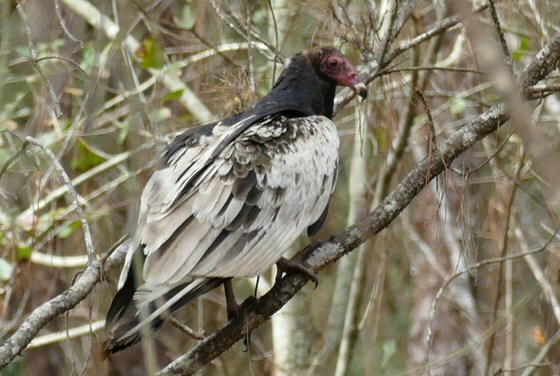 This leucistic turkey vulture was photographed by Dirk Stevenson of The Orianne Society at Little Satilla Wildlife Management Area last month. The lack of black results from leucism, a genetic mutation that prevents melanin and other pigments from being distributed normally to plumage, according to feederwatch.org. The bird's unique look didn’t hinder it from feeding on a deer carcass with fellow vultures.